After the break in a game of 8 ball, you might notice that there are often balls clustered together around the foot spot. 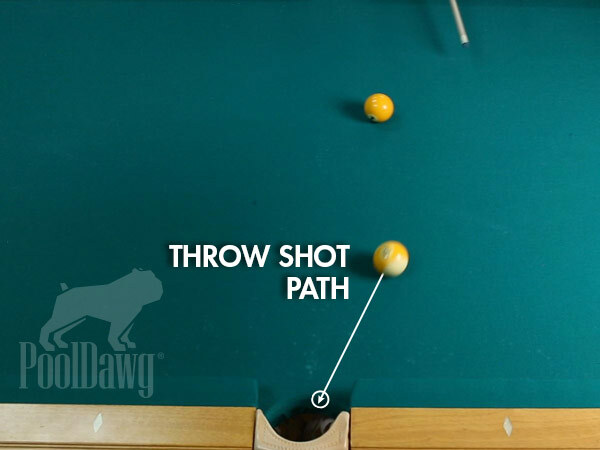 Most players look around the table to find an open shot, but very rarely do they take a close look at the cluster to see if there is a dead shot in there. This can be a missed opportunity! 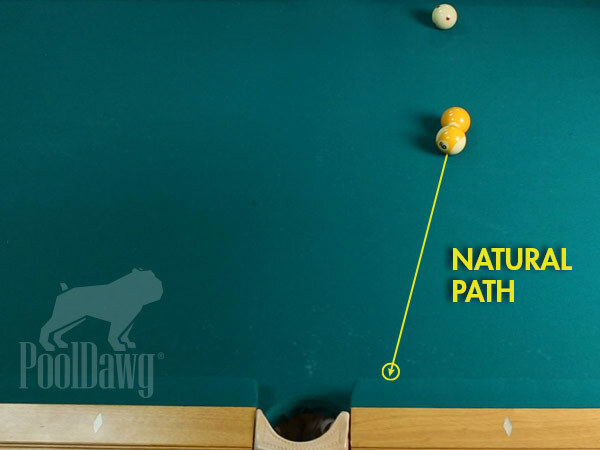 Notice that the 1 ball and the 9 ball are pointing about an inch south of the side pocket. To push the 9 ball to the right, we have to cut the 1 ball to the right! This is not a combination where you cut the 1 ball to the left to cut the 9 ball to the right. 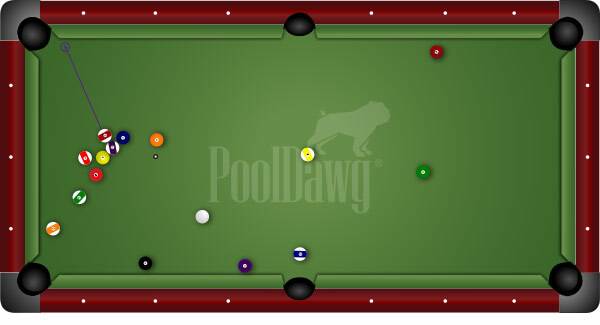 Because the balls are frozen, we “throw” the 9 ball to the right by pushing the 1 ball to the right. This is usually a surprise to some players, but it really works. For average conditions you can usually throw an object ball about an inch per diamond of travel. What that means is that you have to find out where the balls are pointing, how far you want to move the line over, and how far from the pocket the balls are. Here the 15 ball is lined up with the 12 ball about 6 inches above the corner pocket. We need to move the object ball 6 inches to the left, and we have about 2 diamonds to travel. In this case, it looks like we can’t pocket the throw shot. Let’s change this shot a little. Notice here that the 12 and 15 line up about 2 inches above the pocket. Here we can hit the 12 ball on the right, and that pushes the 15 to the left. Since we have a little over two diamonds to the pocket, we have enough room to throw the 15 ball into the pocket. On these throw shots, the softer we hit the ball the more throw we get. These shots really require a delicate touch! Now I’m going to let you in on a secret. There is a way to get a little more throw that you would normally expect. What you do is use spin induced throw as well as collision induced throw to make balls that don’t look possible. Frank Says: "If you really want to work on your pocketing skills, you have to check out the Practice Pro Pocket Reducers!" Let’s say that the 15 was pointed about 3 inches about the corner pocket. We only have two diamonds of distance, so the shot doesn’t go, but, with soft stroke with low left spin, and cutting the 12 ball to the left, we can maximize the throw and amaze our opponents! Look for these shots, and maybe they will open the rack and give you an opportunity to run out!